Wireless network setups (including long range Hotspot Wi-Fi solutions). Cable installations for Cat 5, Cat 6 and other cable types. 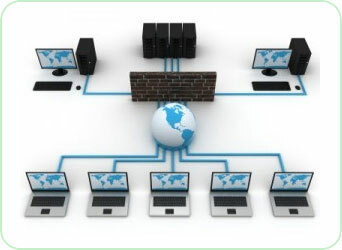 Networking of computers and servers. File / Printer sharing solutions. Remote network Disaster Recovery Backup Solutions. Our team is highly experienced in planning, building, implementing and supporting networks that give clients a real competitive advantage. Reduced costs, increased functionality and the enablement of new services are some of benefits we can help clients achieve by delivering a mission critical network that supports your business objectives.